When you were a child, you might remember your grandparents having dentures. Sometimes, their teeth would come loose when they were talking, which seemed kind of funny when you were a kid. As an adult, you now understand how frustrating that can be. You also know that dentures make it much more difficult to eat many foods. You won’t be biting into an apple anytime soon. If you get a steak, you know to get a smaller one than you would like. It takes a lot more effort to chew each bite than it did when you still had all your teeth. If you live in Huntsville, AL, Jennifer Perkins, DDS may have the perfect solution. Dental implants are great for seniors or anyone who is tired of loose dentures. With implants, you can speak without worrying that your teeth will come out and eat with confidence that you can bite and chew comfortably. Call 256-801-0002 today if you would like to learn more about how implants could help you. There’s an old saying that if something looks like a duck and acts like a duck, then it must be a duck. Well, dentures may look like teeth, but they don’t act like teeth. So, they aren’t exactly teeth. Are dentures better than having no teeth at all? For the most part, yes. You can bite and chew to a limited degree. With dentures, you can generate about ⅕ of the average bite force of someone with a full set of healthy, natural teeth. That means you can eat softer foods. With foods like chicken or beef, you may have to chew each bite seven or eight times to break it down as well as one chew with real teeth. That can leave you will a sore jaw by the end of a meal (which will probably come before you eat the whole steak). You could try using a denture adhesive. This can make your teeth a little more secure, so you don’t have to chew quite as much. Even so, it’s still not like eating with your real teeth, and the taste of the adhesive might change the flavor of what you’re eating. The big problem with traditional dentures is that they are not connected to your jawbone. Your dentures rest over your gums. Since they aren’t anchored in place, they can slide over the surface or slip out of position relatively easily. The roots of your natural teeth were embedded in your jawbone. This held them firmly in place, and it allowed you to generate more force since your bone was directly aiding you with every bite and chew. 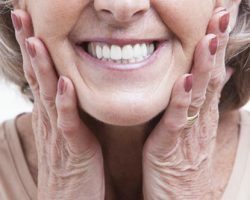 To make your dentures more like real teeth, you need to restore that direct connection to your jaw. That’s exactly what dental implants do. When implants are placed in your jaw, they take the place of your missing roots. Your dentures can then be attached to your implants. This keeps them stable (without any adhesive), and it allows you to generate nearly as much biting power as you could before you lost your teeth. Ready To Start Enjoying Meals Again? Wouldn’t you love to order a full plate of the foods that you love the next time you dine out with your friends? Would you love to go to the next family cookout confident that you can eat anything that anyone has brought to share? If the answer is yes, then you need to call 256-801-0002 or contact us online. Dr. Perkins will gladly examine your mouth and answer any questions you have about dental implants. Together we can help you feel like you’ve got a new set of real teeth.